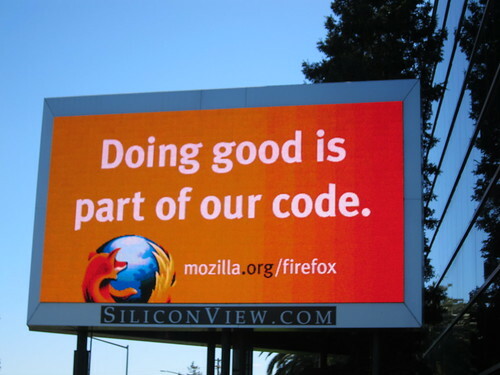 Matt Asay doesn't get the Mozilla Foundations ad campaign. Consumers and enterprises just want a fast, secure browser. Firefox happens to offer both. Let's be honest, there are a few other fast and secure browsers out there. Firefox has its advantages and drawbacks. But what really separates Firefox from Chrome, IE and Safari? Open source all way down. No shareholders to answer to. This means that the guiding principle behind our decision making is doing the right thing for the Firefox users and no-one else. Let's take some concrete examples. Do not track which has been adopted by the Associated Press. A real win for users. Sync replicates your settings, bookmarks, tabs and so on through the Mozilla servers. Now imagine you are collecting millions of users data, you'd want to be able mine that, do data analysis on it, that's valuable. But we don't, it's all encrypted at the clients. We have no idea what's there. If we got hacked, all people would get is lots of encrypted blobs. I got a t-shirt from the recent meeting that said "Doing good is part of our code". Every time I've worn it, I've been asked what that means (once, amusingly at SFO security whilst a fellow Mozillian in a similar shirt got the full pat down). Each time I bring these points up, people are surprised. Each time, I've found people don't think at all about what companies might be doing with the data they collect (or that they are collecting data). Consumers and companies are far more pragmatic in their decision processes. We want something to work, and hope to get it at the lowest possible cost. That seems an over simplified argument, people choose things for lots of different reasons. With several fast, secure browsers to choose from, which one should you choose? Perhaps some of the points outlined above will help people make a decision. If the advertising sparks a discussion about the above, then I think that's a good thing. Disclaimer: I'm proud to say I work at Mozilla and have seen the argument about making "the right decision" play itself out in meetings a couple of times so far.